Monitoring thermal energy usage at logical or localized points of consumption can provide a manager some insight into the real costs of process or space operation, as well as where the greatest benefits may be reaped from efforts at maximizing energy efficiency. Heating and cooling systems or loops that employ water as the heat transfer medium can be simply and economically metered to determine the thermal energy usage of a space or process. 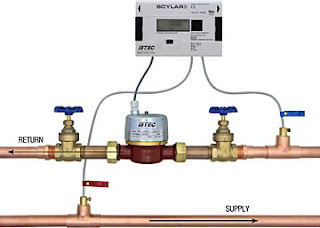 The simple setup consists of a flow meter, two temperature sensors, and a calculating module that collects the output from all three devices and produces a summation of the total heat transferred through the system portion served by the subject piping. This arrangement is commonly called BTU Metering. The size of the system being metered may be an important factor in determining the most effective metering equipment specification. A larger capacity fluid system is likely to benefit from highly accurate measurement equipment, since inaccuracy in temperature or flow measurement is leveraged by the large amount of liquid moving through the system. Heating or cooling systems of small or moderate size tend to be well suited for the application of moderate to good accuracy metering equipment, with its substantially reduced cost of installation and ownership. The key to success is selecting equipment that is well applied for the whole range of anticipated flow rates and temperatures. If your building, plant, or process currently does not have any thermal metering, the installation of this simple device can provide information that assists in making significant progress in building an energy saving plan. More information is available from product application specialists, as well as consultation on how to most economically accomplish your process energy metering goals. Share your process measurement and control challenges with a product specialist and work together to develop effective and sensible solutions.